Never Satisfied, its one of our core values and it speaks volumes to how we innovate within our company. We are always looking for ways to enhance our customer experience, and the new features on our Photo Booths are just one of the ways we are doing just that! 1. ARFX – it’s like Snapchat for photo booths! Stick your tongue out and watch those cute puppy ears appear on your head! Get silly with several different features of this kind. 2. Green screen backgrounds – Step on up in front of our green screen, and the background of your photo can become anything you want it to be – no seriously, anything! We have a series of backgrounds to choose from, or we can design a custom one for you. The possibilities are endless. 3. Filters- now you can add colorful filters over your photos, or give them an old fashioned feel with a black and white filter. Having the ability to choose the colors of your photo on the spot is pretty awesome! In addition to these three brand new features, we have added to our booths, we have also begun routinely offering GIF creations! You can send these directly to your inbox on the spot and have those memories for years to come! 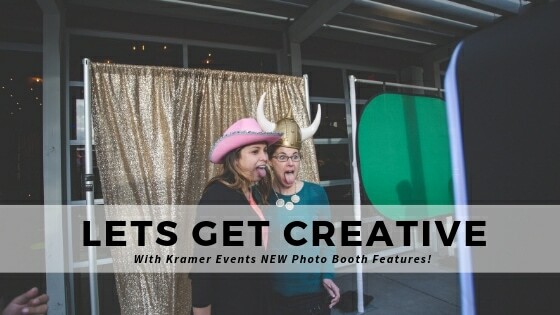 Learn more about our Photo Booths today!